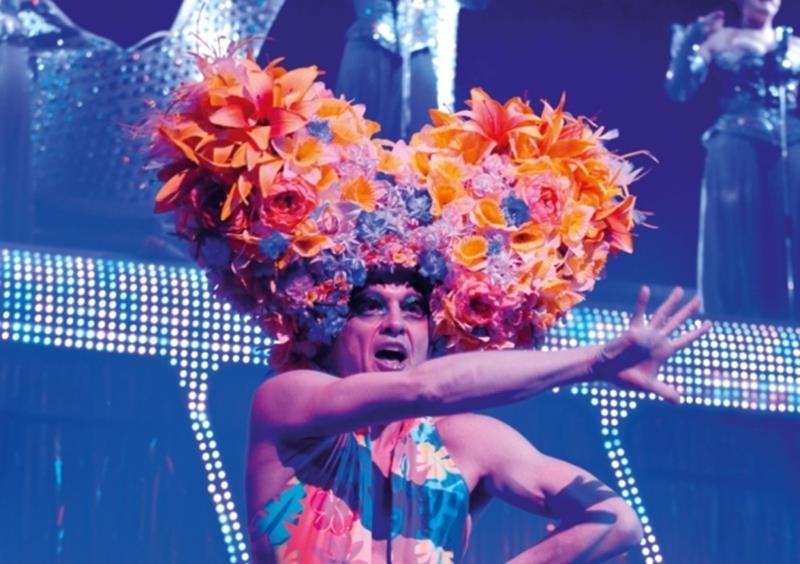 To say that Priscilla Queen Of The Desert is a little bit camp, would be like saying that Hamlet is a little bit tragic. Based loosely on the 1994 film of the same name, it tells a story of two drag queens and a transsexual who aboard their battered bus christened ‘Priscilla’, travel the 2000 miles from Sydney to Alice Springs, with the trio’s mileage being ultimately as much about self-discovery as the journey itself. 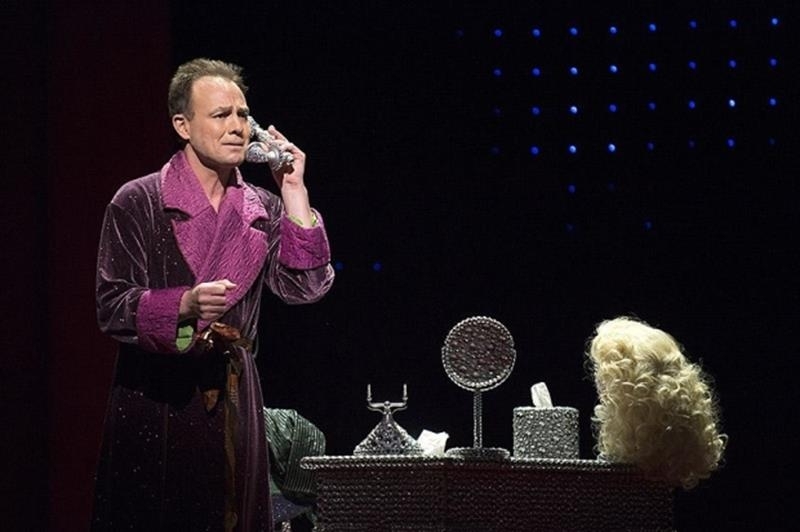 Jason Donovan plays Tick, who earns his living as a drag queen (Mitzi) at a Sydney Club. He gets a call from his wife asking him to play a series of dates in Alice Springs and to meet his six year old son for the first time. Accompanying him is Adam, a delightful petulant Kylie-obsessed drag queen known as Felicia, who on the night was played superbly by stand in Robin Mills. But it was Simon Green who stole the scenes as transsexual Bernadette, capturing the grace, dignity, wit and wisdom of someone who has lived life to the full. Her flooring of a red neck bigot was a highlight in a show full of highlights. 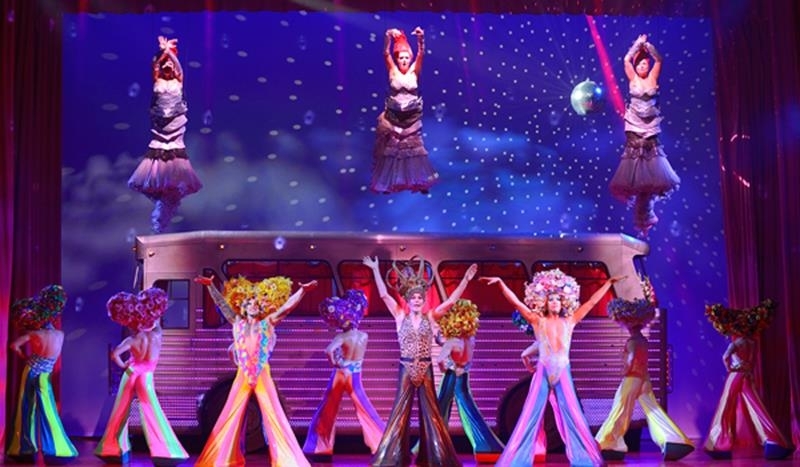 With vibrantly coloured costumes, wigs, hats and shoes, including bell bottomed, platform heeled onesies and a mini dress made from flip flops; costume directors Tim Chappel and Lizzy Gardiner’s imaginations must have been in over drive. There was also a score of disco floor fillers from I Love The Night Life (Disco Round) to MacArthur Park. With other well-known numbers like I Will Survive, Don’t Leave Me This Way, Go West, Hot Stuff and a few Kylie classics along the way, you couldn’t help but tap your feet. Although Donovan’s singing voice wasn’t the most powerful of those on stage, he used it to good effect in numbers like Say A Little Prayer and Always On My Mind, and threw himself wholeheartedly into the energetic dance routines as well as bringing tenderness to the reunion with his son. As unhappily married mechanic Bob, Philip Childs also delivers a poignant performance, jumping the matrimonial ship to join the bus. His mail order wife Cynthia, exuberantly played by Julie Yammanee was hilarious in her Pop Muzak routine. 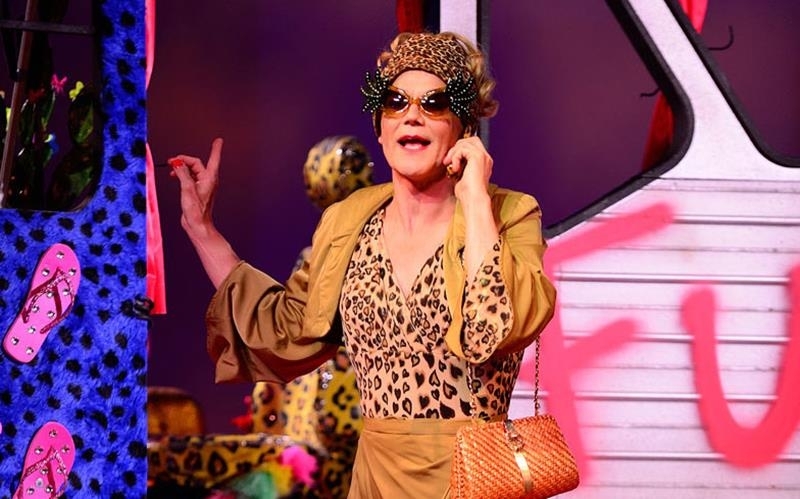 Callam MacDonald had a ball in his role as Sydney drag queen, Miss Understanding, belting out What’s Love Got To Do With It, in a stonking, stomping and extremely funny take on Tina Turner. Another piece of class comedy was unleashed by Catherine Mort as a butch, bosom bouncing Shirley, throwing her weight about in a seedy bar in Broken Hill. 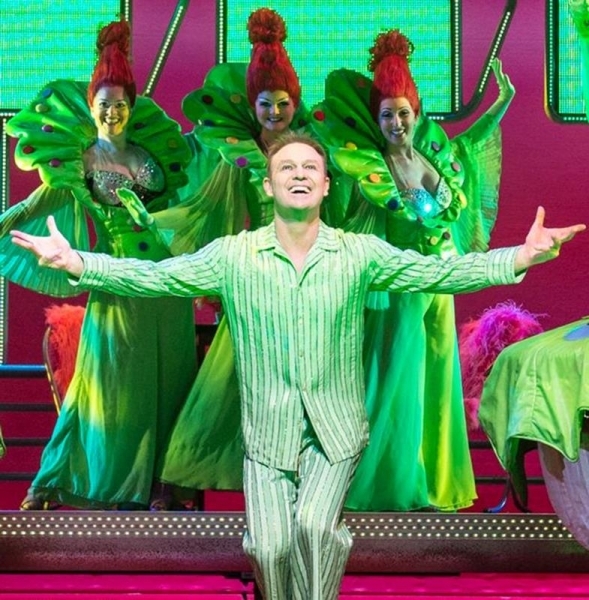 Whilst social attitudes and gay rights have moved on since Stephen Elliott’s film classic, this musical odyssey still touches on homophobia; illuminating the downside of parading sexual differences. The road trip was at the very least thought provoking as the tender scene after Adam has been beaten up shows. Their vulnerability was there for all to see as the very moving Bernadette told her travelling companions, “Never forget the cost of our choices”. This was a flamboyant, funny and entertaining show. Tick was reunited with his son who accepts him for what he is; Bernadette finds love with Bob and the delightful Felicia achieves a life time ambition of singing a Kylie song on Ayers Rock whilst dressed in a frock. It was a remarkable journey and at the end of the evening the audience were up on its feet dancing in the aisles, and there is no better recommendation for a fun night out than that.